The biotechnology industry is a booming one, having experienced significant growth over the last several decades. In fact, the field is one that will likely continue to grow rapidly, particularly as science and technology change to accommodate our growing public needs. For some people, debates around issues such as genetically modified (GM) foods have actually spurred their interest in a career in the biotechnology field. If you are one of those people who is intrigued by this area and has a passion for science and the laboratory, then a career in biotechnology may be worth considering. A typical day in the field of biotechnology can vary a great deal, depending on what subfield you have chosen for your career and employment. Those who work in the laboratory will likely work with a wide range of apparatus. Techniques may include DNA separation or DNA analysis and similar biological techniques. You may also have a role in the maintenance of organisms used for genetic engineering purposes. Such organisms could include plants, animals, bacteria or patients. Ensuring that the subjects of investigation are healthy is vital to good laboratory practices, which means that your attention to detail will fare well in a biotechnology career. Another type of person who would do well in a biotechnology career is someone who tends to keep up-to-date on the latest research and developments in the field. Biotechnology is a rapidly evolving field that is saturated with new developments on a regular basis. You will need to be capable of searching for data and information relevant to your job role. In addition, you will need to read relevant journals on a regular basis to make sure that your work is at the forefront of the biotechnology field. Creative types can also excel in a biotechnology role because some jobs require that a person conjure up new ideas and then design and execute these ideas into a practical reality. A self-starter who can design experiments or techniques as well as create new concepts to benefit biotechnology will do well in this field. Most people who enter the biotechnology field will be trained scientists, with at least an undergraduate degree. Some may work as interns for biotechnology companies that focus on areas such as genetic modification. Genetic engineering can involve exposure to dangerous organisms, which means that you have to demonstrate a high level of safety and care in your work. Given that the biotechnology industry is a booming one with enormous annual profits, qualified biotechnology workers are important to ensuring that the industry continues to flourish. You can work in areas such as health care, food production and genetic modification or you may even choose to work in areas that involve an environmental focus. 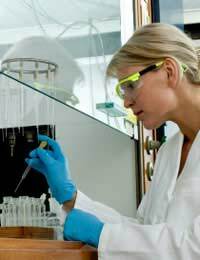 Whether you want to work in the development of genetically modified seeds or you are more keen to work in the laboratory testing and safety aspects of genetically modified products, there is an area in biotechnology that might complement your unique skills, interests and abilities. Your best approach is to speak to an academic advisor at your school or a local university about how to obtain a career in biotechnology.